Jarrod Mullen has played 211 matches for Newcastle since making his debut 12 years ago. 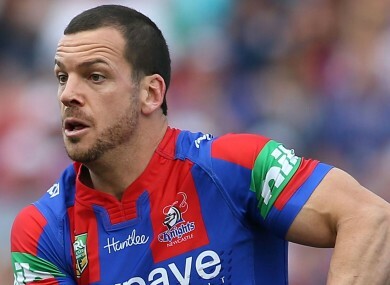 NEWCASTLE KNIGHTS PLAYMAKER Jarrod Mullen has been provisionally suspended under the Australian NRL’s anti-doping policy. A test on 29 November returned a positive A sample for the anabolic steroid drostanolone, which is prohibited by the World Anti-Doping Agency (WADA). Mullen, who is banned from playing while the provisional suspension is in place, now has the opportunity to have his B sample analysed. “The club is obviously extremely disappointed,” Knights CEO Matt Gidley said. “The club has a strict governance programme, the players are regularly educated and fully aware of the consequences of going outside our governance guidelines. “From here, there is a formal process we need to follow under the guidelines. Mullen, 29, has played 211 matches since making his Knights debut in 2005 and is a key member of the first team at the club, who finished bottom of the ladder last season. He is considered to be one of the most consistent playmakers in the NRL and represented New South Wales in State of Origin in 2007. The Knights’ first match of the 2017 campaign is away to New Zealand Warriors on 5 March. Email “NRL star suspended after testing positive for steroids”. Feedback on “NRL star suspended after testing positive for steroids”.